Cosmin Minea	– In a world where fantasy movies are the most popular, and where the president of America is a proven fact-maker or fact-shaper or as some might call him, even an outright liar, the world of sports has also boarded the fantasy train. The fight between the multiple boxing champion Floyd Mayweather and the mixed martial arts champion Conor McGregor has been the richest, heaviest promoted sporting event in history but also a fantasy or if you prefer, an outright lie. There is no essential difference between fantasy and lie. It is us, who accept the lie, and transform it into fantasy. The Mayweather – McGregor fight was never accepted as a lie but was in many respects sold to us as a fantasy. The greatest boxer of his time faced the perfect combat machine of his generation. The Irish warrior, the ultimate fighter, Connor McGregor met the richest man in sports, the invincible, the perfect master of the art of fist fighting, Floyd ‘Money’ Mayweather. It was a dream matchup, a once in a lifetime event, the great battle of our times. It didn’t make any sense but we loved it, we talked about it and we eagerly awaited the big fight night. How could a boxer, so a specialist in clean fist fighting, face an all-around fighter, good at kicking, tackling, takedowns, strangles, hand, body and feet combat techniques? Mayweather doesn’t know how to kick, doesn’t know how to fight on the ground, he knows only fist fighting, just a part, usually the beginning of a mixed martial arts fight. Naturally, the only way they could fight was in a boxing match. But how could someone who has never boxed and who is a very good fighter in other sports, competitively challenge the best boxer of his generation? Obviously, he couldn’t. In any scenario, he couldn’t. If you want a parallel, let’s say a triathlon champion, so an excellent all around biker, swimmer and runner, competes with Michael Phelps in the pool, or with Mo Farah on the track, or with Chris Froome on the bike. It doesn’t make any sense. It isn’t any competition, any game. It is at best an exhibition game, for charity and at worst a circus act, with people dressed in clowns, punching, running and behaving hilariously. But Mayweather and McGregor were far from fighting for charity and neither war in a circus arena. They were fighting for cool, hard cash. Why was this matchup even made if it seemed so ridiculous from the beginning? Firstly, because for many, it didn’t seem ridiculous at all. And secondly, because many were willing to pay a lot to watch it. In America alone, between 5 and 6 million households payed 99 bucks to watch the ridiculous game. 6 million, 99 dollars, why?People are no experts in boxing and people like fantasies. The biggest fighters of their time to square off in the ring is like the great armies going against each other in Lord of the Rings. The fighters new it and they put on a show. They could have fought for real and Mayweather to win in 2 rounds. But it would have been too obvious especially for what their payday was. The money they made was the only thing more ridiculous than the actual fight. The fight managed to live up to the hype of both the non-experts and the ones who know boxing and MMA. For the former, it was a pretty spectacular fight. Both guys took some beating, there were some hard-fought moments. 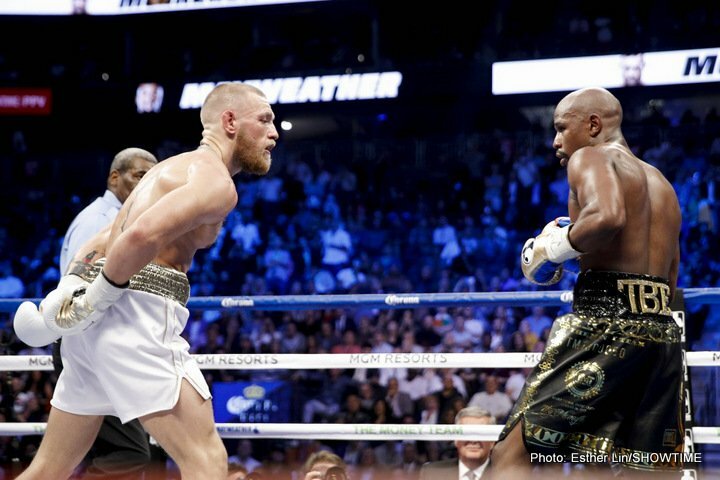 McGregor put on a far better performance than most expected and threw some excellent combinations on Mayweather who was in the end the better boxer. For the latter, a minority who is not heard at all these days, the fight was indeed a joke. They saw a Floyd Mayweather flat on his feet in the middle of the ring for rounds, something he has never done in his 20 years of professional boxing. Everyone who watched boxing, and Mayweather in particular, knows that his biggest skill is his defence that translate into terrific ring movement, foot work and body movement. Floyd’s head moved quicker than his opponents punches. In his last 10 matches or so he didn’t even use his fists in a guard to protect him but stayed with his hands down and just moved his head, his body and his feet all around the ring. But look at him in the McGregor fight. He stayed for 6 rounds in the middle of the ring, without any movement at all, just waiting to take the Irishmen’s punches. At times McGregor even looked like a good boxer.He felt great in the ring. And so did Floyd, who always had a big smile on his face in between rounds. His smile in the corner was probably the most revealing thing of what was happening in the ring. Mayweather simply let his opponent box a bit, throw a few punches, touch him a bit. He could have knocked him out in the first rounds. It was easy to do this. Watch Mayweather’s defence with Saul Alvarez, or with Many Pacquaio, or in any other fighter. Watch his counterpunching as well. Mayweather is known for it. When his opponents throw at him, he simply doges and then hits back with cruel efficiency. I haven’t seen him to do this in the McGregor fight. The hardest part for both must have been the promotion of the fight before. My word, the tens of press conferences, the hundreds of acts, the thousands of insults they threw at each other. They were actors, entertainers, and this is how they made their money. In the ring, they gave us a big, fat, pretty lie. But we liked it. We didn’t want sport, we wanted entertainment sold as sport. They boarded the fantasy train and they might as well stay there. It might be very well possible that other will follow through. It is not that the death of sport will follow soon. But we might have just witnessed the born of the entertainment sport. The future sounds exciting. Previous boxing news: Dillian Whyte-Dereck Chisora II: The perfect fight for the October 28 Joshua-Pulev under-card? Next boxing news: Terence Crawford – The best in boxing today?